This Study Guide is designed to enhance your understanding of ADD/ADHD Alternatives in the Classroom, an ASCD book published in December 1999, by helping you make connections between the text and the classroom, school, or district in which you work. Written by Thomas Armstrong, this book shows how the ADD/ADHD paradigm is a limited and artificial way of viewing children who have difficulties with attention and behavior. You can use this Study Guide before or after you have read the book, or as you finish each chapter. If you have not read the book already, you may wish to scan the Guide very quickly and highlight questions and instructions that are designed to prompt your thinking prior to your reading the text material carefully. The study questions provided are not meant to cover all aspects of the book but, rather, to address selected ideas we thought might warrant further reflection. Most of the questions in this Study Guide are ones you can think about on your own. But you might also consider pairing with another colleague, or forming a group of people who have read (or are reading) ADD/ADHD Alternatives in the Classroom. Do an online review of the literature critical of the ADD/ADHD paradigm. Discuss the limitations involved in making interpretations from data gathered through brain scan research generally and with respect to ADD/ADHD specifically. On a scale of 1 to 10, where 1 = total non-subscriber to the ADD/ADHD paradigm, and 10 = total subscriber to the ADD/ADHD paradigm, plot where you are before and after reading this book. Discuss why you placed yourself where you did. (Remember that you are not saying here that the behaviors of impulsivity, hyperactivity, and distractibility do or do not exist; we're assuming that they do, but what we're questioning is whether the existing ADD/ADHD paradigm adequately explains why those behaviors exist in the way that they do in certain such children). Discuss the issue of nature versus nurture in the etiology of childhood behavior problems. Can one commit oneself to genetic causes and still maintain that nurture remains an important (even primary) influence? How important is the role of context in creating the behaviors associated with ADD/ADHD? Is it possible to speak of ADD/ADHD outside of specific contexts? Can one argue that ADD/ADHD exists as an objective, neutral scientific entity quite apart from any specific context (and, therefore, that it exists in each and every context such a child inhabits)? Determine the percentage of students in your school or school district who have been diagnosed with ADD/ADHD. How does this number compare with national averages (e.g., the 3–5% figure used by the American Psychiatric Association, or other national surveys)? Find out (if possible) the number of students in your school district who are taking Ritalin or other psychoactive medications for ADD/ADHD. Compare school statistics in terms of the number of students taking Ritalin per 100 students. What sorts of factors might account for differences between schools (socio-economic, curricular/instructional factors, etc.)? Interview students about how they feel about taking Ritalin or other psychoactive drugs and how they feel about being labeled as ADD/ADHD. Read Thomas Kuhn's The Structure of Scientific Revolutions and discuss the problems inherent when an individual from one paradigm attempts to communicate with a person using another paradigm. Also, do you feel that the ADD/ADHD paradigm is due for a "revolution" or will it likely continue as "normal science" for some time to come? George Friedrich Hegel was one of the first western philosophers to emphasize the importance of historicity in interpreting the meaning of experience (e.g., we can understand why events occur by understanding the broader zeitgeist or "spirit of the times"). To what extent can we interpret the current popularity of ADD/ADHD as due to our own spirit of the times? Read Bonnie Crammond's 1994 paper "Attention-deficit hyperactivity disorder and creativity: What is the connection?" in the Journal of Creative Behavior, 28(2), pages 193–210, and discuss students labeled ADD/ADHD in your classroom or school who might more properly be considered creative people (CP). Because each individual is always attending to something or other from moment to moment, isn't it a misnomer to label a student as suffering from attention deficit disorder? Discuss different types of attention (e.g., selective, global, etc.) and differentiate, if you will, between the "attentional styles" that various students in your school with this label exhibit. Utilizing Howard Gardner's theory of multiple intelligences as an organizing framework, look at the students in your school who have been diagnosed with ADD/ADHD in terms of their most-developed and least-developed intelligences. What are the implications of the results in terms of instruction? To what extent do you believe that the increase in children identified as ADD/ADHD is due to inappropriate developmental expectations (e.g., expecting 1st graders to do things that 2nd graders were expected to do 10 or 15 years ago, expecting kindergarteners to do things that 1st graders were expected to do, etc.)? Defend your answer. Determine the ratio of boys to girls in your school among those who have been identified as having ADD/ADHD. Do you believe that boys have been unfairly represented in this sample due to inappropriate instruction for boys (e.g., lack of rough-and-tumble activity, hands-on instruction, frequent changes in activity, etc.)? Look at your total group of students who have been identified as having ADD or ADHD as a sole diagnosis. Among these students, who do you feel might be suffering from anxiety or depression? Make appropriate referrals for additional evaluation of these particular cases. Select 15–20 strategies from ADD/ADHD books for teachers and parents and classify them into one of two categories: externally controlling or internally empowering. If a given strategy has been classified as externally controlling, then determine what you need to do to alter the strategy so that it can be used in an internally empowering way. Do a literature review of the research of Purdue researcher Dr. Sydney Zentall or other researchers working in the area of multiple intelligences and ADD/ADHD over the past ten years, and incorporate these findings into your overall instructional approach with students identified as ADD/ADHD. Develop a list of attention-grabbing strategies to use with students identified as ADD/ADHD. Determine the extent to which students labeled ADD/ADHD may be learning things at school that aren't being explicitly taught to them (e.g., they are learning in incidental, peripheral, accidental, or unintentional ways). Document these incidents and discuss their importance. Must we insist that students learn only the material that we are directly and intentionally teaching them, or can we make room for the fact that some students will learn more at school in indirect and oblique ways? Discuss how an ADD/ADHD-labeled student's penchant for video games might be channeled into acquiring knowledge through appropriate computer software. Do a case study as a part of an action research project and report back on the results (e.g., choose an ADD/ADHD-labeled student with a high level of interest in video games and explore ways to interest them in instructionally relevant software). In particular, explore the extent to which the student's own hyperactive mind interacts favorably or unfavorably with the hypertext features of the software (or the Internet). What interface features (including the presence of hypertext) promote the best fit between the student and the computer program? What do kids labeled ADD/ADHD think about all day? Give them beepers and tell them that you will randomly beep them during the day. Give them simple forms to record what's going on in their minds (allow them to pass if they don't want to share specific content). On the form, ask them to describe emotions, images, physical sensations, words, abstract ideas, music, dialogue, monologue (inner self-talk), or other phenomenon. Select a poorly achieving student labeled ADD/ADHD who seems to be a strongly physical learner and brainstorm 25–30 ways he can express his physicality during the school day (both inside and outside of the classroom). Then implement as many of these strategies as possible over a period of three months and note any changes in the student's behavior, attention span, and academic achievement at school. Do the same thing for a poorly achieving student labeled ADD/ADHD who shows creative abilities in the arts. Brainstorm 25–30 ways to give her a chance to express herself artistically during the school day. Practice using alternative ways of describing students labeled ADD/ADHD with your colleagues when holding meetings or informal discussions. Instead of "my ADD kid," try "my active alert student," "my spirited student," or "John—you know—the incredible artist I've got in my class." Note the differences in your own attitude (and your colleagues' attitudes) toward the students when this more positive language is used to describe them. Create an instructional module called "Hyperactive Heroes," consisting of biographies of famous people who were labeled ADD or ADHD (or might have been if they'd grown up in today's world). For example: Winston Churchill, Beethoven, Louis Armstrong, Sarah Bernhardt, Cher, Leonardo da Vinci, Thomas Edison, and Albert Einstein. Set up a peer-teaching or cross-age tutoring program where students labeled ADD/ADHD teach things that they have competence in (skateboarding, drawing, wrestling, etc.) to students labeled "gifted" who lack (but desire) those skills. What happens to the self-esteem and achievement levels of ADD/ADHD-labeled kids once they become the teachers? Experiment with two types of classroom environments: one that has very little stimulation and one that has a great deal of properly structured stimulation. Notice how students labeled ADD/ADHD behave and attend differently in the two environments. What major differences do you see? Use behavior modification strategies in an internally empowering rather than externally controlling way. For example, with contracting, have students cocreate the contract, or with time-out, let the student choose the time-out area. Do behaviors improve more when students have some power in the decision-making process? 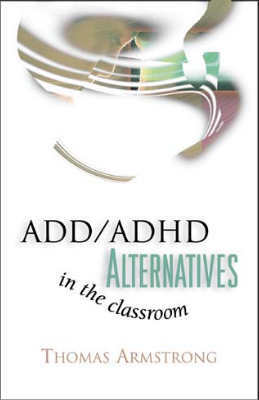 ADD/ADHD Alternatives in the Classroom was written by Thomas Armstrong. This 126-page, 6" x 9" book (ISBN 0-87120-359-6) is available from ASCD for $9.95 (ASCD member) and $11.95 (nonmember). Copyright 1999 by Thomas Armstrong. To order a copy, call ASCD at 1-800-933-2723 (in Virginia 1-703-578-9600) and press 2 for the Service Center. Or buy the book from ASCD's Online Store.